Transparent is a critically acclaimed drama broadcast by Amazon. Created by the non-binary producer Jill Soloway, it centres on the life of the transwoman, Maura Pfefferman. Since its first season, it has been praised for promoting trans visibility and for offering positive depictions of the LGBT+ community. This chapter demonstrates how Transparent, a quality drama, educates through characters, emotion and storytelling. It argues that the series’ pedagogy is complex because it combines contradictory techniques. 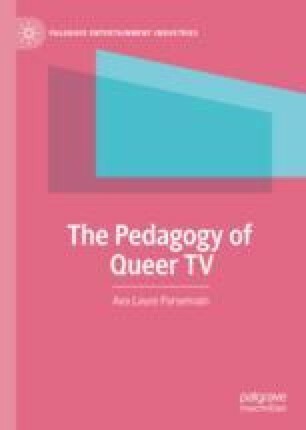 While it invites viewers to learn about trans experiences through Maura, the protagonist played by Jeffrey Tambor, the text also uses its many other queer characters to offset her pedagogical limitations. Moreover, although it often teaches through realism, Transparent sometimes disrupts the illusion of verisimilitude, using unrealistic sequences to show what being queer feels like.